the film Francis , followed by five more in the series; 1951–54—star of the TV series The Colgate Comedy Hour , and The Donald O'Connor Show: Here Comes Donald , 1954–55; performed in nightclubs and cabarets;1956—his first symphony performed by the Los Angeles Philharmonic Orchestra; 1981—Broadway debut in musical Bring Back Birdie ; 1982—in Show Boat , Houston and New York. Address: P.O. Box 4524, Valley Village Station, North Hollywood, CA 91607, U.S.A.
Interview, in Photoplay (London), November 1982. Reed, J. D., "Can You Tap This," in People Weekly (New York), 21 December 1992. Vaughan, Don, "Donald O'Connor: Still Making 'em Laugh," in Filmfax (Evanston), May-June 1995. Donald O'Connor's vaudeville background has been in evidence throughout his film career. Bing Crosby allegedly asked, "Isn't there anything he can't do?" Singer, dancer, and comedian, O'Connor played in many low-budget musicals and established his reputation by proving that, indeed, he could do just about everything. 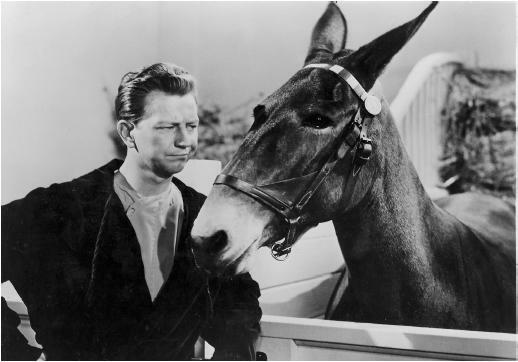 Perhaps his most popular role was as the straight man to a talking mule in six films of the Francis series. He was never stereotyped by that role, however, and throughout the several years of production of those films, he appeared in a number of important musicals and continued his vaudeville exploits in two successful television shows. It was fitting that, in one of his later films, he played Buster Keaton, whose multiple physical talents and vaudeville background were similar to O'Connor's. During the early 1940s, under contract to Universal, O'Connor was cast in a number of musicals, often directed by Charles Lamont, that exploited his vaudeville talents and teenage charm. In Top Man , Chip Off the Old Block , and The Merry Monahans , for example, he was teamed with Peggy Ryan in films that seemed Universal's answer to MGM's Garland-Rooney films. Often called on to assume adult responsibilities, O'Connor's characters won their way in the world (and the girl's heart) by show-business expertise. Later, in more mature roles in Singin' in the Rain , I Love Melvin , and Call Me Madam , he retained some of that youthful quality and spirit of delight in performing. "Make 'em Laugh" from Singin' in the Rain displays all of O'Connor's inventive vaudeville-based skills. As he sings the song, itself a paean to the virtues of popular entertainment, O'Connor performs a series of body maneuvers and slapstick gags: he gets hit by a plank, walks into a wall, gets his feet entangled and falls, and, finally, runs up a wall and backflips off it. Each of these displays him as the limber-legged and rubber-faced vaudeville comedian. Other numbers show his tapping ability, as well. In I Love Melvin he is required to tap on roller skates and, a frequent O'Connor trademark, to assume a variety of identities with quick costume changes. Although he brought his trademark panache to the Francis series, O'Connor is more happily remembered partnering peppy Debbie Reynolds than a quadruped. It is regrettable that MGM could not have given O'Connor a permanent home after Singin' in the Rain : what other dancer stole scenes from Gene Kelly? Of O'Connor's five major shots at big studio musical comedy immortality, only one ( Singin' in the Rain ) is an undisputed masterwork. Whereas I Love Melvin is mere breezy escapism (a sort of upscale version of his Universal Studio romps), Anything Goes is a regrettably garish shortchanging of Cole Porter; yet O'Connor bucks and wings his way through both until their limitations evaporate. Blessed with a partner of equal merit in Vera-Ellen, O'Connor helps Ethel Merman turn Call Me Madam into one of the sunniest transfers of a Broadway hit to the screen. And if nothing in There's No Business Like Show Business matches his silken dancing to "It's a Lovely Day Today" in Call Me Madam , Show Business does provide him with ample opportunities to dazzle aficionados. Despite contending with squeaky-clean Johnny Ray and resistibly upbeat Mitzi Gaynor, not to mention the daunting prospect of coming face to face with Monroe's bosom, O'Connor energetically steals the film by dancing with the exuberance of someone born in a trunk, who could dance before he could walk. If it had been filmed earlier, he would have been the definitive leprechaun in Finian's Rainbow , but such major roles were sadly not his lot; lending class to vulgarly conceived production numbers was his forte. Not faring well after the demise of the Hollywood musical, O'Connor failed to storm Broadway in a foolish sequel called Bring Back Birdie . Nevertheless, he continued to wow his fans in summer stock, embarked on a second career as a composer, and made a graceful all-too-brief comeback as a dance instructor in Ragtime . Watching his clowning around on a standout episode of Frasier 's 1995–96 season and struck by his galvanizing routines showcased in That's Entertainment! III , one can only regret the waste of his talents for the past 30 years. Despite the extinction of the film musical, O'Connor, one of the last movie stars to have trained in vaudeville, has achieved a special place as an indispensable link among various types of popular American entertainment.